Fine art, Illustration, graphic design and the art philanthropy of Sam Morrison: Illustration Friday Submission- "Dreams"
Here's my first submission to Illustration Friday. This weeks challenge was to depict the concept of "DREAMS". 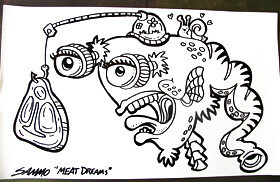 The title of this piece is "Meat Dreams". I illustrated it in 10 minutes with a Sharpie marker on some scrap Epson paper from work. I then took this piece of art along with 7 other similar illustrations and placed them around town (vicksburg, MI) for people to find. 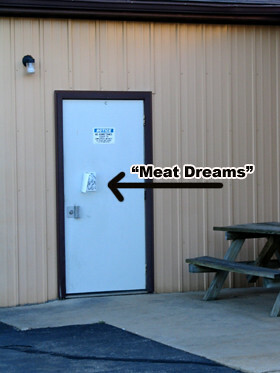 ("Meat Dreams" was posted on the receiving door of a mfg. facility). Sometimes I put contact info on my pieces, sometimes I don't. This time I placed them anonymously. i'd love it if i arrived for work one a.m. and found that on the door. that's a fun concept, sharing your work like that. and the illo itself is very, very good, too! That's a wild idea! I'd love to find a little surprise like that. I often fantasize about changing street signs around so that they say different things, but that really falls into the category of adolescent vanadalism...it work properly given my age! Anyway, I love your Guerilla Art...keep up the war! LOVE this, I think the illo is great and the idea of posting them is just wonderful. Love, love, love the wack-a-doo factor. This week's best in my opinion. Thank you for your comments... I'm glad you each appreciated the idea.